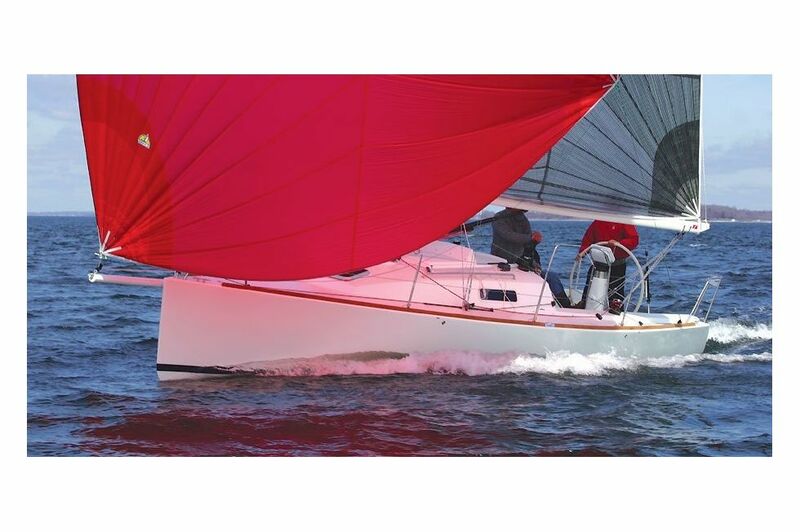 J/95 restores an American yachting tradition, dating back to the 1800’s, of fast centerboarders that were as much at home navigating shoal inland waters as they were crossing oceans. Remember the Baltimore Clippers? As late as the 1960’s, centerboarders dominated offshore racing under the Cruising Club of America (CCA) Rating Rule. Carlton Mitchell’s Finisterre won the Bermuda Race an unprecedented 3 times. In the 50 years since, great strides have been made in hull design, lighter/stiffer rigs, high-tech sails and advancements in cored composite construction. J/95 combines the best of tradition with modern technology and is quality-built in the USA! Share the joy closer to home. For the first time, many sailors will be able to keep a good-looking boat in front of their homes. J/95 has the capability of broadening a day’s sailing range by 5-10 miles. That includes venturing safely outside of inlets into open water... even staying dry and comfortable when a 20-knot sea breeze kicks in. J/95’s large cockpit, the privacy of its enclosed marine head and the convenience of returning home under power if the wind dies, make picnic day sails more appealing to amily and friends. Sailing is at its best when the joy can be shared. 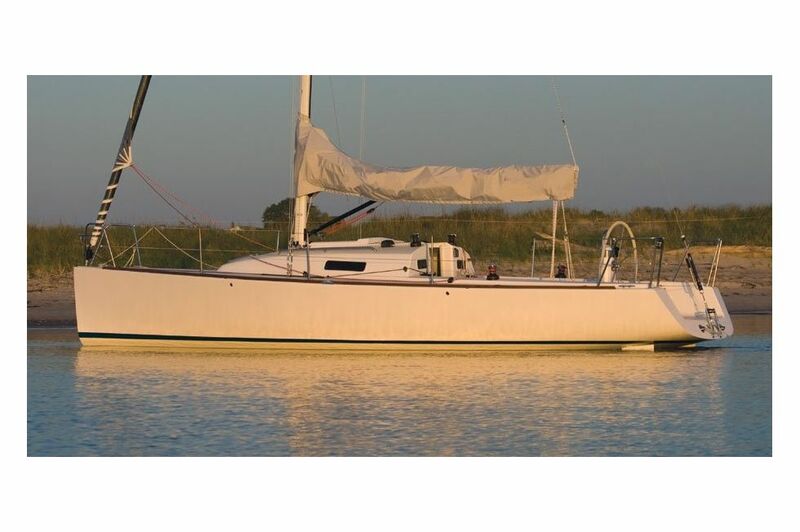 J/95 has the versatility and the qualities to optimize your sailing experience over a longer season, closer to home. The J/95 opens up a new world to sailors who may have otherwise thought that high performance in shallow water was the special preserve of power boats. With the J/95 you can explore the many new harbors and shallow bays and estuaries and enjoy the ultimate thrill of sailing a fast, sleek sailboat anywhere you want- the ultimate in sailing freedom! The J/95’s performance hull emphasizes high form stability, relatively narrow beam and an easily driven shape. A modest upwind sail plan powers this boat at speeds and upwind tacking angles that sailors expect from a J. 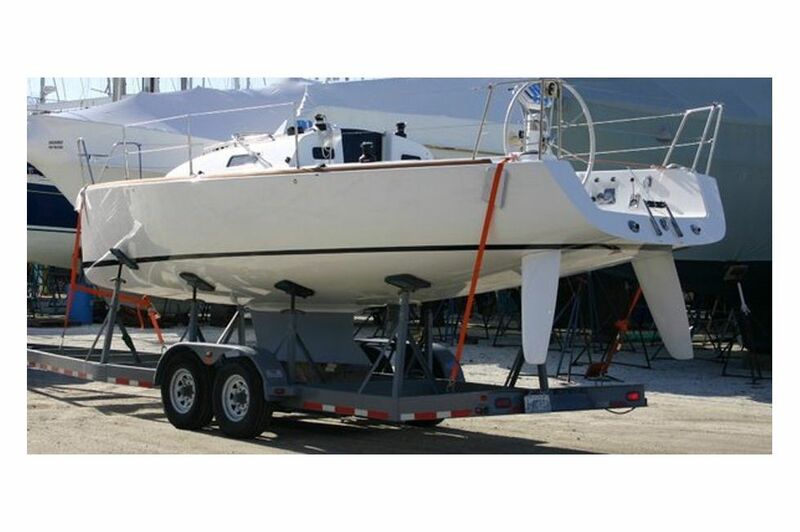 The J/95 will sail upwind with the centerboard fully retracted and retain its stability while doing so. This is a distinct advantage over boats with vertical lift-keel arrangements where stability is all but lost (and sailing not an option) when the keel in the “up” position. Over 90% of J/95’s ballast is in the fixed lead keel, with the rest in the foil shaped bronze centerboard. To optimize steering control during shoal draft operation, the J/95 is specified with tandem rudders. Sailboats of the past with single shoal draft rudders share the common trait of horrendous weather helm load when sailing at large heel angles, especially close reaching in a breeze. This is true of everything from traditional catboats up to the finest keel-centerboard designs to the CCA Rule back in the 1950s and 60s. Likewise deep rudders which pivot up for shallow water create huge helm loads when raised. 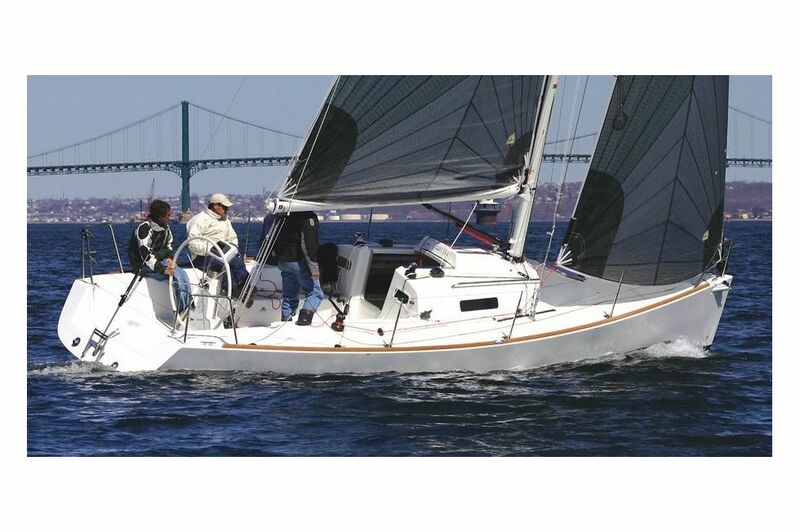 J/95 will be a dream to steer in any situation with centerboard up or down. Balance and steering control are two of the key features which set the new J/95 apart.While reaching and running the J/95 has high speed potential, especially with a large masthead asymmetric spinnaker and a raised centerboard. 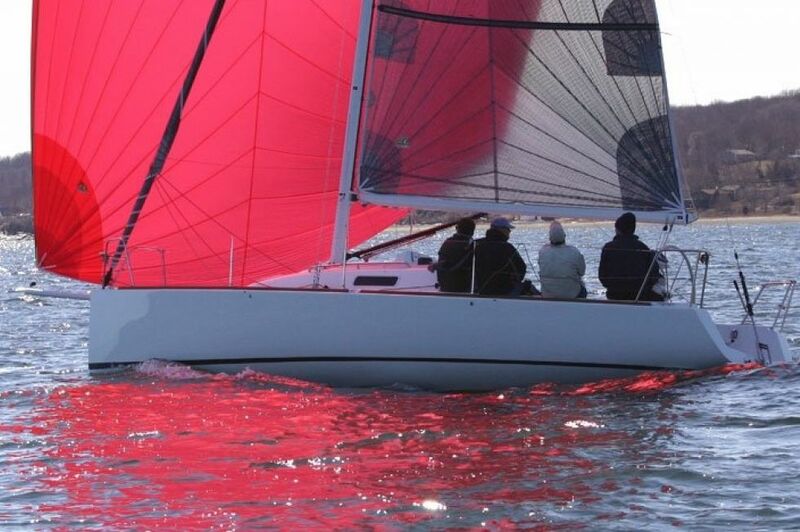 This is a boat that’s even easier to handle than a J/105, with the same high maneuverability in tight quarters that sailors of smaller J’s have been showing off for years. Hull and deck built with resin infusion molding system using biaxial and unidirectional glass fabrics and Baltek end-grained balsa and foam cores. Structure is engineered to ABS and ISO standards. 10 year transferable warranty against hull blistering, 5 year structural warranty. GRP molded structural grid with longitudinal and transverse keel support beams and composite mast bearing beam with aluminum tapping plate. White gel coat hull with single tapered boot stripe. Two large cockpit seat storage lockers. Swimming and boarding platform with integral safety telescoping ladder. Fixed 2,250 lb lead keel bolted and bonded to shallow molded sump in hull. Pivoting 200 lb. cast bronze centerboard. Fully removable centerboard shim system assembly with custom SS plates, pivot pin, and mechanically fastened UHMW shim plates. Centerboard lifting system with Spectron Pennant from Hall Rigging, 6:1 Harken purchase leading through the deck to the cockpit for an adjustable sailing draft between 3’ and 5.5’. Interior access port to centerboard lifting components within head area. 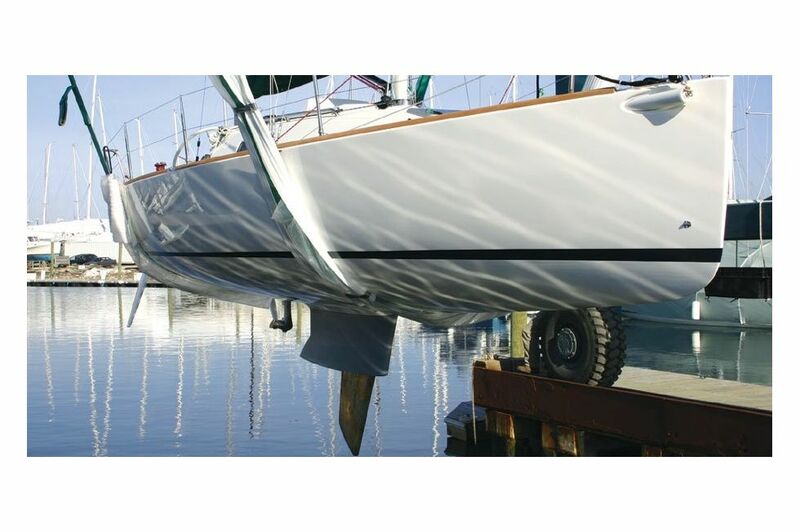 Balanced twin rudder system with self-aligning rudder bearings and SS rudder shafts. Edson steering components including bulkhead steerer, radial drive, tiller arm, link bar, articulock idler sheaves and wire chain assembly. 44” leather covered wheel mounted on custom molded steering pedestal. Ritchie binnacle mounted compass and custom fabricated SS wheel guard/handhold. 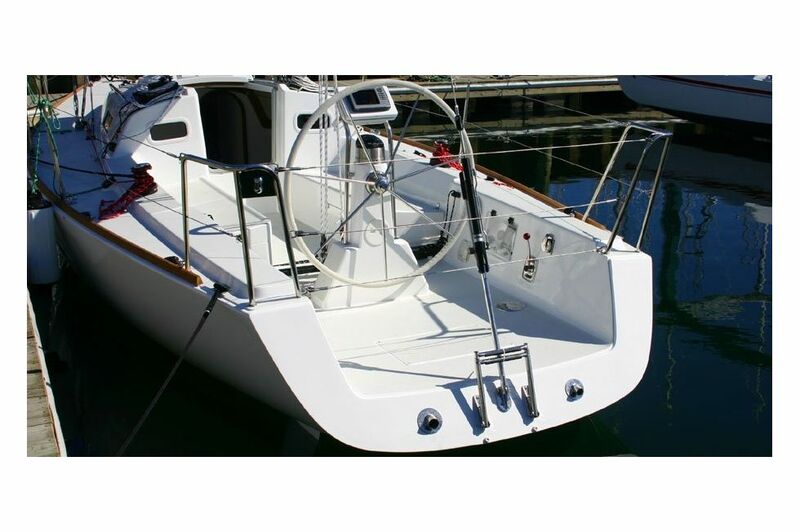 Hall Spars tapered aluminum mast, with double airfoil aluminum spreaders, main, jib & spinnaker halyard sheaves, luff track integral to section with mast finished in off-white Awlgrip. 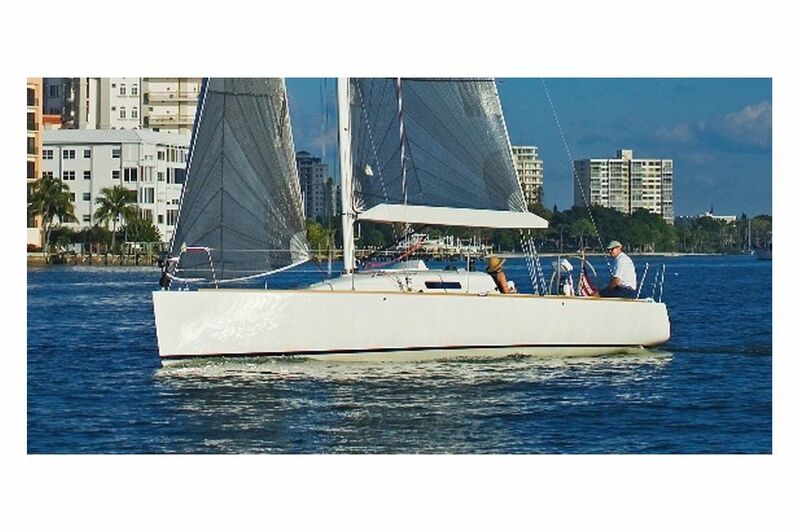 Aluminum boom with provision for 2 reefs, 8:1 internal mainsail outhaul in Awlgrip off-white. Continuous rod rigging with adjustable shroud turnbuckles. Sailtec integral -8 hydraulic backstay adjuster. Headsail furler with control leading aft through 2 fairleads to cam cleat mounted on port cabin side. Bowsprit prep package – internal fiberglass sprit tube installed with flush cover. Optional asymmetric spinnaker gear package includes carbon sprit, bearings, retrieval purchase, blocks and running rigging. Off-white ORC foredeck toe rails (Option for varnished full length teak rails). Low maintenance custom stainless handrails on cabin house (P&S). Self-tailing winches mounted on cockpit coamings (P&S). Self-tailing winches mounted beside companionway (P&S). Custom stainless fabricated mast collar with halyard attachment bar. Two pin stop cars on jib T-tracks with cheek blocks mounted on cockpit coaming forward of winches. Floor mounted mainsheet traveler track with 4:1 traveler control system leading to cockpit vertical wall to cam cleats (P&S). 5:1 Mainsheet purchase system leading to swivel cam base on a custom SS riser mounted on centerline aft of the traveler. 10:1 fine tune adjustment system. Four 8” SS mooring cleats. Interior ventilation from two opening ports in sides of cabin trunk and offshore style forward skylight deck hatch above V-berth. (option for 2 add’l cockpit opening ports). 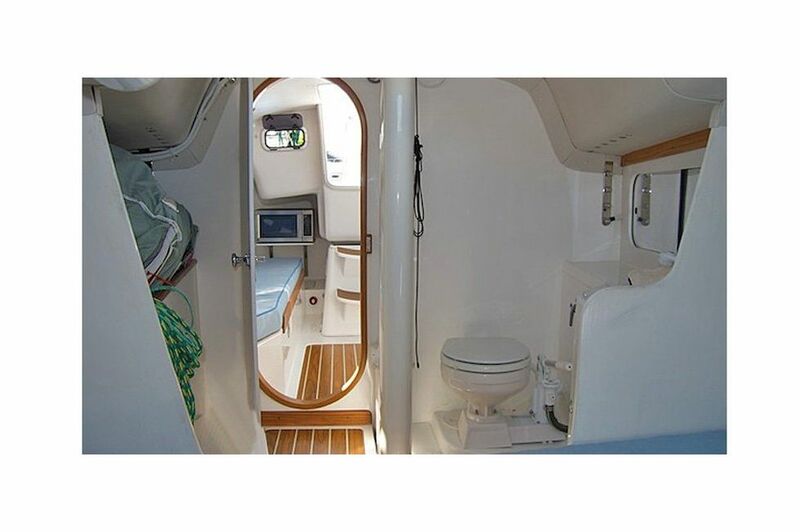 Companionway opening with SS covered PVC slider tracks, large gutter drains, molded seahood with sliding cover. Acrylic offshore removable drop-board with inside/outside lockable hasp. Cockpit operated manual bilge pump operable from the helm position with SS transom exhaust fitting. Two polypropylene mesh line bags for halyard and sheet line tail storage. Custom designed and fabricated SS chainplates, stemhead and backstay fittings. Four folding padeyes for attachment points of spinnaker blocks. Custom SS bow and stern rails with integral navigation lights. SS removable stanchions with double lifelines P&S and at transom. 14 HP engine with saildrive and 15” geared folding propeller. Engine instrument panel with tachometer, engine hour gauge and water, oil pressure alarms and separate fuel gauge in cockpit with acrylic splash cover. Waterlock muffler with exhaust run aft to SS transom exhaust fitting. 15 gal fuel tank with baffles & inspection port. 12V DC On/Off battery switch. UL approved stranded, tinned copper ABYC color-coded wiring. Bonding system to meet ABYC regulations. Two swiveling reading lights in main cabin. Off White main bulkhead with varnished teak trim, teak oval door opening with white door. 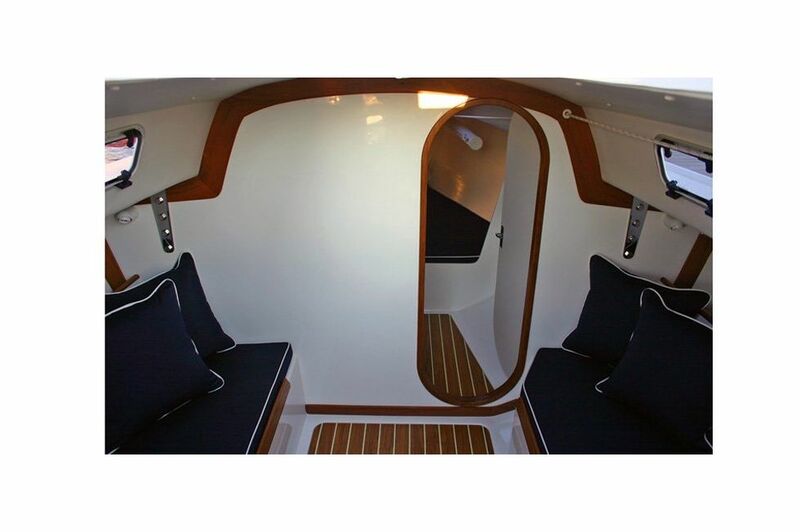 Teak and holly synthetic high-wear cabin sole in main cabin and head. Teak trimmed storage bins outboard of each settee berth seat back. Raritan PH-II marine head with 14 gal holding tank and "Y" valve. Choice of fabrics for settee cushions. Vinyl liner finish on main cabin & head overhead and main cabin hull sides. Air dry gelcoat finish on hull sides in head and V-berth area and aft storage lockers. Full length teak toe rail in lieu of standard, with custom mid-ship chocks, scupper drains and finished with gloss-varnish. (2) Add’l cockpit opening portlights P & S.
Lifeline Gates P & S.
Thurston Dodger with side curtains. 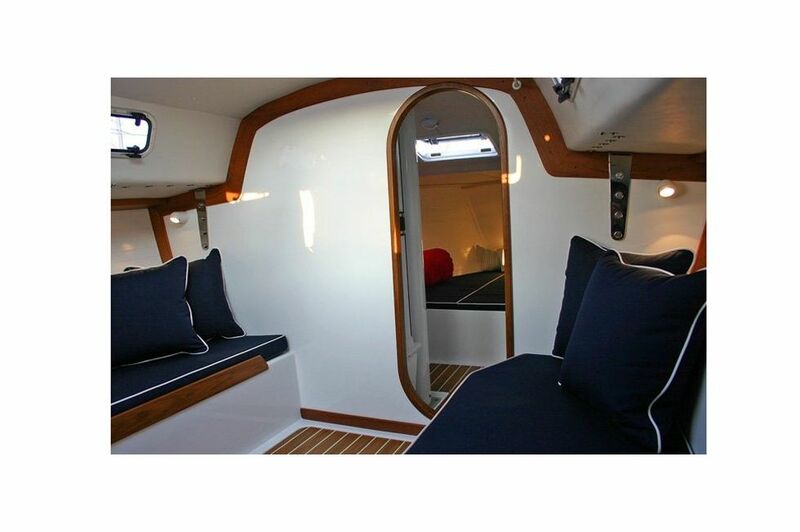 V-Berth Package: V-berth cushions and swiveling reading lamp. Pressure water system with 20 gallon bladder tank, water pressure pump, faucet in head and cold water cockpit shower. Heat exchanger water heater to run off engine only: (Requires Pressure water option). 110V Shore Power: 30amp shore power cord, deck receptacle, belowdecks breaker, Xantrex battery charger, AC panel, one 110v outlet in nav panel, equipment leakage circuit interrupter (ELCI), galvanic isolator. Forte Carbon Mast in lieu of standard with Harken Type A mast track. Asymmetric Spinnaker Package: retractable carbon fiber bow sprit, sprit bearings, one spinnaker halyard, two spinnaker sheets, tack line, retrieval purchase, and five Harken blocks.